Peter Witte is a photographer and writer who lives in Arlington, Virginia, with a philosopher, two children, and a handsome dog. His photography has been exhibited at the Washington, D.C. Convention Center and has or will soon be featured in the literary journals Flyway, Eclectica, Heavy Feather Review, and Midwestern Gothic. 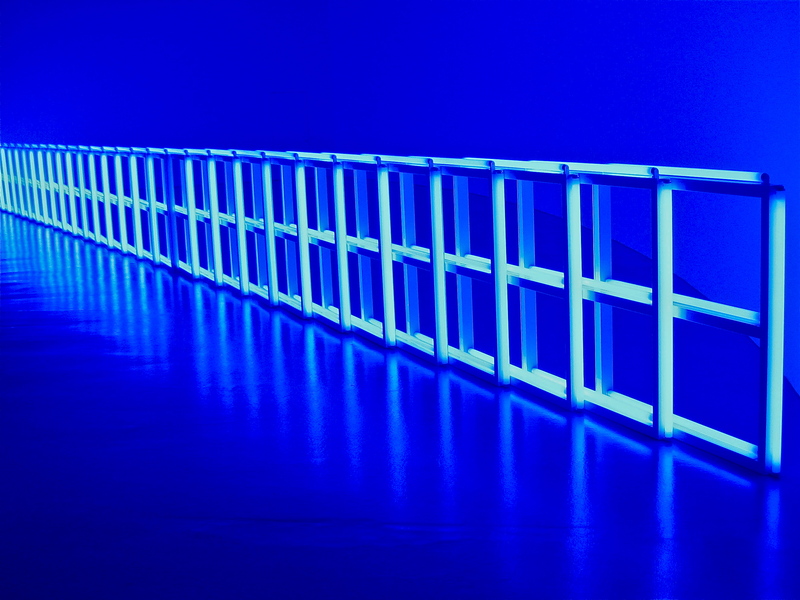 Light, 2012 was taken at the Hirshhorn Museum in Washington, D.C.
even if it tastes like stale candy. like kleenex caught on a high twig. various dreams of little consequence. in the image of a middle-age crew cut and torn jeans. revealed in the ridges and dips of your thoughts. an authentic aroma, arriving home. Allison Grayhurst has had over 200 poems in more than 140 journals, magazines, and anthologies throughout the United States, Canada, Australia, and the United Kingdom, including Parabola, South Florida Arts Journal, The Antigonish Review, The New Quarterly, and Poetry Nottingham International. She is the author of Somewhere Falling, Common Dream and, most recently, The River is Blind. Grayhurst lives in Toronto with her husband, two children, two cats, and a dog. She also sculpts, working with clay. I played a game of chess with you, our bodies the field. You unfastened my plaid skirt and substituted a checkerboard. I pulled off your khakis and numbered your parts in rows and files. We wrestled under a tent of red, light scattering through the Egyptian thread count to turn our white skins crimson. Your hair fell like leaves on my face, your need galloped like horses through me, raising me up, making a pawn a Queen. You marshaled your forces, kept me pinned, set a trap and sprung it. The chessboard tilted. My pieces clung magnetically to your surface. You castled. I rushed you diagonally, my mitre gaping like a shark’s mouth. You bridled at my attempts to rein you in. You shone like Quixote on his nag in the starlight. You boldly leapt what hedged me, centaur knight, hooves slicing, but I wouldn’t follow. Now you have lost interest in the game. We go back and forth in the same moves, over and over. Our pieces are captured, and the clock’s run down. I call it a draw, not a stalemate. I’ll never concede, nor knock over my king, no never, never, though I’m in pieces. Jan Steckel is a former physician who retired early from taking care of Spanish-speaking low-income children because of chronic pain. Her poetry book The Horizontal Poet (Zeitgeist Press, 2011) won a Lambda Literary Award. Her fiction chapbook Mixing Tracks (Gertrude Press, 2009) and her poetry chapbook The Underwater Hospital (Zeitgeist Press, 2006) also won awards. Her writing has appeared in Yale Medicine, Scholastic Magazine, Bellevue Literary Review, and many other journals and anthologies. Her work has won numerous contests and has been nominated three times for a Pushcart Prize. Doug Holder’s work has appeared in Rattle, Main Street Rag, Endicott Review, the new renaissance, The Boston Globe Magazine, and elsewhere. He teaches writing at Endicott College in Beverly, Mass. and Bunker Hill Community College in Boston. Holder founded the Ibbetson Street Press in 1998. The Neo-Nazi drops below the Peak village in his Gortex jacket and walking boots. He hears the sweet, sweet sound of birdsong and looks up to see two larks wheel across the sky, then dip towards orchid-sewn grasses. And something stirs within him. Such beauty, he thinks. Further down the hillside, Eva is not yet aware of him. She skirts the edge of the quarry lined with barbed wire, and the German word for it, Stacheldraht, comes uninvited into her mind. She thinks of her father. Also uninvited. Eva hears the larks too and wonders at the duality of life: the beauty and brutality. In the quarry, grass, sod and rock have yielded to dynamite and machinery. She looks at the clawed-out earth and remembers the Lancaster that had so carelessly off-loaded onto her Aachen home, remembers her four-year-old self holding her ears under the cellar table, the falling bricks. Eva turns right, away from the quarry and heads uphill. Soon her path will cross with the Neo-Nazi’s. He will recognise her accent as German, imagine a kindred spirit. Eva lifts her head and sees him above her. Something about his face reminds her of her father. But Papa is best not remembered: not the execution, not the public disgrace, not her mother’s isolation because ‘verdammt, she’d brought it on herself by marrying a Jehovah Witness;’ … not the whispers of Kriegsdientsverweigerer. Eva greets the stranger above her. In a few moments’ time he will tell her of his love for her birthplace. He will extol the virtues of Nazi-Germany. He will deny the Holocaust. But for now, as they draw level, they smile at each other. Helen Moat spent her childhood squished between siblings in her Dad’s Morris Minor, travelling the length and breadth of Ireland. She’s still wandering. From travel writing, Helen is now exploring the alien world of flash fiction. Helen was runner-up in 2011 British Guild of Travel Writers Competition and was highly commended in the BBC Wildlife Travel Writing Competition this year. Silence was your softest part. carved in a dead tree. Erica Lee Braverman received an MFA in Poetry from the University of Oregon, and now lives in Eugene teaching English at a local community college. Her work has appeared in MiPOesias and Virginia Quarterly Review’s Instapoetry Series. It is such a pleasure and privilege to read this work; it enriches my life. Thank you to each of the writers and thank you for sharing it with me, Michelle.